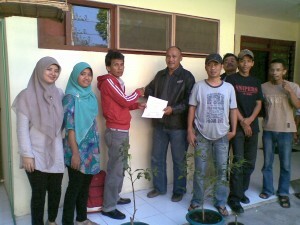 My second Duty to go to Tuban & Gresik to conduct Internal Safety Training and it was First of July 2012. The weather at Tuban & Gresik is similar the same with Jakarta, It take a approximately an hour and fifteen minute from Surabaya to Gresik by Car. So Far my duty was running well and all the Operation employee at Tuban & Gresik is very enthusiastic with the trainings. Safety Awareness, it’s about introduction in Health, Safety and Environment as a general Regulation in BSU. HUET, It’s about “Helicopter Underwater Escape Training” if the Employee working to go offshore and travel with Helicopter as a Transportation and the passenger knows about how to escape from the danger of Helicopter going down to the sea. Some of Oil & Gas Company and other Clients is require this Safety Regulations. Fire Fighting, it’s about how to extinguish the fire by using Fire Extinguisher, it is normally happen inside building/halls/house/office. CPR, Cardiopulmonary Resuscitation is an Emergency Procedure which is performed in an effort to manually preserve intact brain function until further measures are taken to restore spontaneous blood circulation and breathing in a person in cardiac arrest. It is indicated in those who are unresponsive with no breathing or abnormal breathing, for example agonal respirations. It may be performed both in and outside of a hospital. CPR involves chest compressions at least 3-5 cm deep and at a rate of at least 100 per minute in an effort to create artificial circulation by manually pumping blood through the heart. In addition, the rescuer may provide breaths by either exhaling into the subject’s mouth or utilizing a device that pushes air into the subject lungs. This process of externally providing ventilation is termed artificial respiration. Current recommendations place emphasis on high-quality chest compressions over artificial respiration. Insufflation, also known as “rescuer breaths” or “ventilation, is the act of mechanically forcing air into a patient’s respiratory systems. This can be achieved via a number of methods, which will depend on the situation and equipment available. All methods require good airway management to perform, which ensures that the methods is effective. Mouth to mask – most organizations recommend the use of some sort of barrier between rescuer and patient to reduce cross infection risk. One popular type is “pocket mask”. This may be able to provide higher tidal volumes than a bag valve mask. 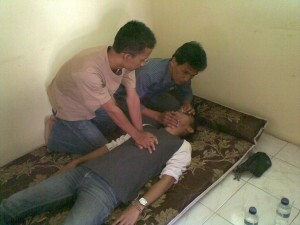 CPR can do with 2(two) person involve each other, one person do the Insufflation, and the other one do the CPR. As a conclusions derived from the observation that this Safety Induction can be repeated every 6 (six) months, based on the needs of the Clients. I would like to thank you for all the team operation at Tuban & Gresik Branch Office, and it was really good and nice have meeting with all the team, maybe someday I really want to go there again, I do hope that all the trainings will be useful for Employee.